Three Tier Renaissance Fountain with Italian Palazzo Urns Package number 1016 | Fountain City Art Ctr. This Garden package and each one of our concrete Garden Ornaments are handmade in the USA, using our secret poured concrete formula so each piece resists all weather climates. Our craftsman use acid stain formulas to bring our statuary to life with unique colors. 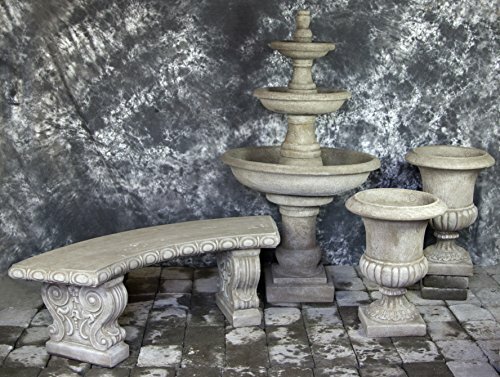 This package includes 1 Three Tier Renaissance Fountain, 2 Italian Palazzo Urns 24 inches H x 18 inches W (ea) 1 Classic Curved Bench 17 inches H x 52 inches W x 15 inches D, 1 Pump (180GPH 6'cord) & supplies included. Northlight LED Lighted Praying Buddha Water Fountain Outdoor Patio Garden Statue, 23"